It’s currently low season in Croatia. Prices are good, and Croatia's attractions aren’t crowded. Make new friends over drinks along the Adriatic..
Connect with the culture in charming old villages..
Mali Ston: Meet a local oyster farmer and learn about the cultivation of oysters, before enjoying a delicious Sea-to-Table tasting of fresh shellfish and local wine..
Dubrovnik: Toast the culmination of your journey with a typical Dalmatian Coast Celebration Dinner, accompanied with wine and grappa.. Dining Summary: 13 Breakfasts (B), 1 Morning tea (MT) and 6 Dinners with Wine (DW), all with tea or coffee..
Get into the heart of Paklenica National Park on foot and by bike, a place where the mountains meet the sea, where stunning deep gorges, lush forests, and lost villages wait to be explored. Sea kayak out on the silken blue waters of the Adriatic, dramatic mountains the backdrop while following the coast to the delightful fishing hamlet of Vinjerac. 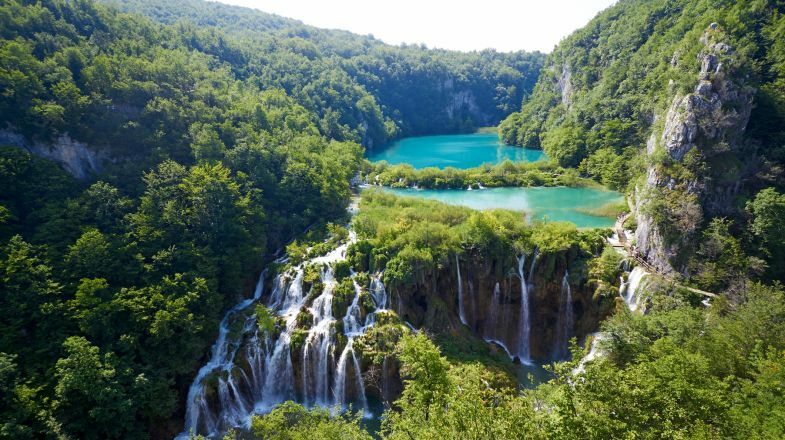 Stroll through Plitvice Lakes National Park, marvelling at luminous lakes and waterfalls that seem to have been sketched by an artist. Makarska â Port and Riviera. Loviste â Fishing village and local market. Enjoy a guided exploration of Split and its staggering Roman masterpiece: Diocletian's Palace. Learn the local trade with an immersive fishing experience on Lastovo Island. On Korcula Island, your 'feature stay' overlooks a tiny bay and the gorgeous Adriatic. Sail the scenic Croatian coastline. Visit UNESCO World Heritage-listed destinations Dubrovnik and Split. Croatia is situated in the Southeastern edge of Europe with one end facing to the Adriatic Sea and the other adorned with almighty mountains which offers a variety of experiences as a traveler. Croatia has glitz and glamour in its culture and a certain mystery and peacefulness as well; while you can experience the coldest winters and the hottest summers in Croatia, the sea softens all the seasons to merge smoothly together towards the coastal end. The diversity of the geography in Croatia is one of the many reasons that you should consider Croatia as your next destination. If you want to get the Europe experience, and yet you can afford to travel to only one country, Croatia is an excellent choice since it offers you an experience in one go, which many European countries would offer collectively. Croatians are very hospitable and friendly people, and they cook simple and delicious food from the freshest ingredients they get from both land and the sea due to the location of the country. The cities like Split and Pula boasts of Roman architectural wonders that stand in the same league of Italy and Turkey themselves. Dubrovnik -- the “Pearl of the Adriatic”, the stunning Plitvice Lakes, Pula Arena and Euphrasian Basilica are some of the popular tourist attractions in the world. Don’t make the mistake of sticking to Dubrovnik! Croatia has many beautiful towns and islands to visit. Even when raising your hand to order a round of drinks at the bar, never raise your thumb, index finger and middle finger together. This is a sign of Serbian nationalism and is considered taboo in Croatia. Croatian drivers can be aggressive and some coastal roads don’t use barriers. Consider opting for public transit instead of renting a car. While train links don’t cover the entire country, buses are a reliable option. If travelling from another European country, get ready to carry multiple currencies. Croatia is part of the European Union but continues to use its own currency: the Croatian kuna. Croatia is perfect for a beach holiday, but be sure to pack a pair of water shoes as the coasts are quite rocky. If you decide to travel off-the-beaten-path, keep a keen eye out for unexploded minefields left over from Croatia’s war of the early 1990s. Croatia has seasonal weather so please do check up on the best time to visit Croatia before planning your tour. And if you’re still hunting for more things to do and places to explore in Croatia, do check out our Croatia Travel Guide for more information.